We are putting up this profile on behalf of our son.  He has completed bachelor of finance and currently working for a well reputed firm. He is very responsible, hard working and understanding guy with great sense of humor. He is passionate about music and appreciates the art. He is broad minded with high respect for indian values, culture and traditions. We are seeking a beautiful, well educated, and family oriented girl from suitable family background having perfect blend of modern and traditional values. We live in a family with traditional values. Both his father and mother are working professionals. He has one sister, who is married.